A general view of the Baboo Ghaut colonnade with the River Hooghly beyond. Erected in 1830. Also known as Rani Rashmoni Ghat. The ghat was founded by Rani Rashmoni in memory of her husband. The Baboo Ghaut stands near a main bathing place in Calcutta. The Steam Engine, which pumped water from the River Hooghly to clean the city streets, may be seen on the extreme right of the photograph, with shipping on the river in the background. The tall colonial structure, which is the landing berth of the ghat, is a fine Doric style pavilion with pillars. The marble tablet at the entrance quotes a Governor General lauding the public private collaboration 200 years back. Partially hidden by paint, it reads ‘with a view to encourage the direction of private munificence to works of public utility has been pleased to determine that this ghaut constructed in the year 1830 at the expense of Baboo Raj Chunder Doss shall hereafter be called Baboo Raj Chunder Doss’s Ghaut’. 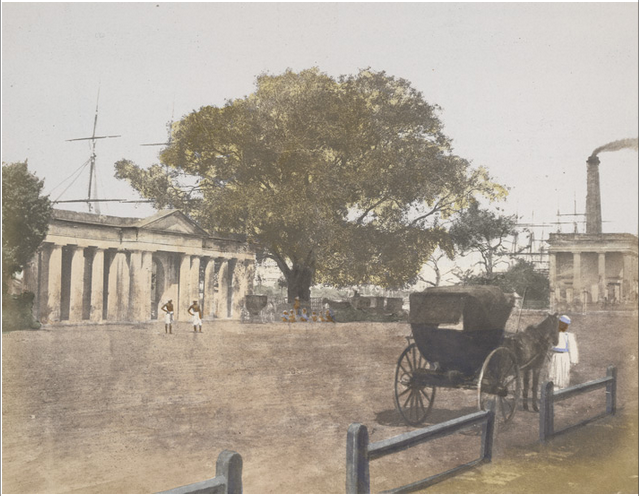 This photograph was taken and hand-coloured by Frederick Fiebig in 1851.